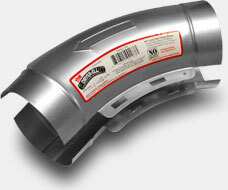 Every Dryer-Ell increases airflow efficiency and can be measured the same as straight pipe. 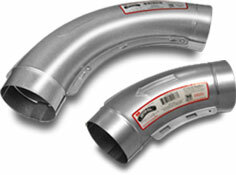 Dryer-Ells are ten inch radius, smooth interior elbows that reclaim allowable duct length. Based on ASHRAE methodology for calculating friction loss, they can be measured the same as straight pipe. This removes the run length penalty most code requires for every elbow. Adopted in ICC International Mechanical and Residential Code, Dryer-Ells can be the perfect solution for length-of-run issues. 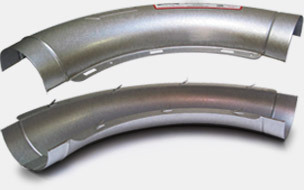 The Dryer-Ell increases dryer efficiency, and--when replacing a restrictive small radius elbow--it can be used as an alternative to expensive booster fans. Click here for a printable introduction to Dryer-Ell efficiency gains. Be certain to review the Product Details and Benefits sections to see how the Dryer-Ell will contribute to proper venting efficiency (much more detail in the menus above). While the Dryer-Ell is a relatively new solution to run-length problems, it is possible that your favorite supplier already has them in stock, ready for your next project. You may find out by checking the Supplier Locator. If they don't already carry it, please let them know you would appreciate the convenience of being able to get Dryer-Ells right in your hometown. You can even give them this quick and easy Information Sheet that will make it simple for them to get set up.